When you’re in need of a pacifier, it’s generally because there’s a fussy baby you’re wanting (needing) to quiet. And it never fails that the fussier the baby, the deeper the pacifier is hidden in the recesses of the diaper bag. Chris from Pickup Some Creativity guest blogs over at Craftiness Is Not Optional with a tutorial showing how to make this “binky bag”. 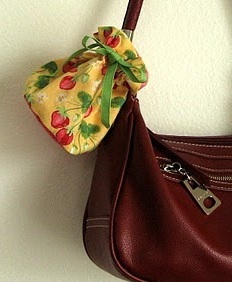 This handy bag can button around the strap of a purse or diaper bag, keeping the pacifiers clean and at the ready. Find out how to make one at Craftiness Is Not Optional.